Before I get to the subject of today’s post, I want to talk a little about one of my pet peeves that keeps occurring with some regularity, especially now that this here food blog website thingy seems to have increased in Technorati ranking in the past few months. Content theft is probably the number one bane of bloggers worldwide; with respect to food bloggers, it hits home especially since the vast majority of content is personally produced, with a labor of love. Is it so difficult to ASK PERMISSION FIRST when you see a particularly enticing or attractive picture you want to repost, or when you read a post that moves your spirit that you want to reblog? My e-mail address is on my “About” page; sending me an e-mail takes less than 60 seconds. You mean to tell me that sixty seconds is too long to wait? Really? If you don’t feel like sending an e-mail, an alternate solution is to post something in the comment section of whatever post it is that ‘grabs’ you. Again, the time spent making the request is a drop in the bucket. Instead, when I see a picture that’s obviously lifted from this food blog, I experience a twinge of sadness because the resulting confrontation could have been easily avoided if someone had taken the time to extend a little courtesy. I suppose if there is a silver lining, it must mean that I have arrived. Today’s instance of content theft was the second time in as many months. I guess I should be secretly (and perversely) pleased, right? One classic dish that I look forward to when spring finally arrives is pasta primavera. Typically, whenever I encounter it, it’s a conglomeration of every possible non-starchy vegetable under the sun, thrown together in a thick, creamy sauce redolent of garlic and cheese. It’s a little sad because that kind of creation doesn’t register ‘spring’ to me. 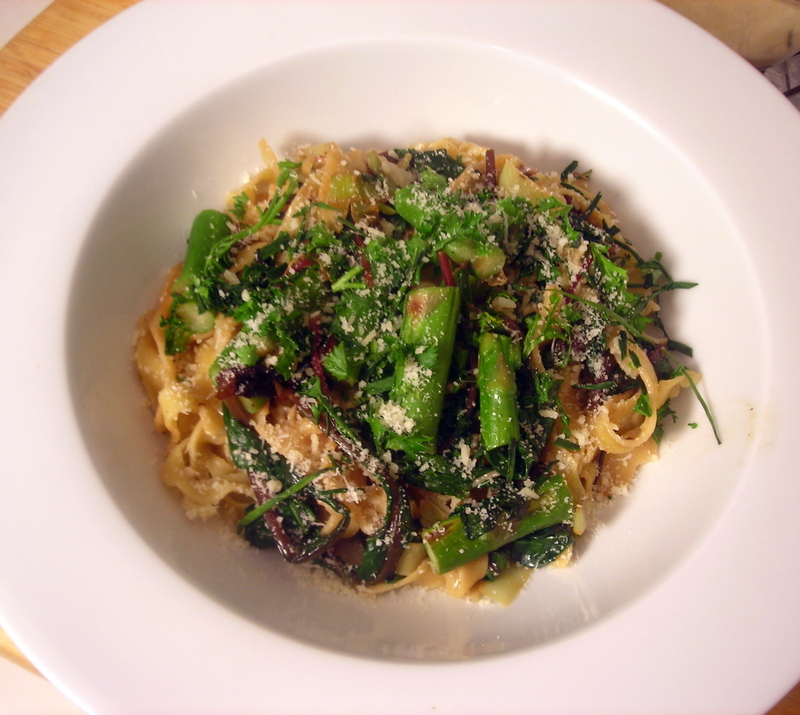 For the version pictured below, I’ve combined asparagus, leeks and spinach with some fresh carrot pasta. Note the absence of tomato, red bell pepper and zucchini. While those vegetables are wonderful, they are to my aesthetic, more “summery” than spring-like. Bring a pot of water to a roiling boil. Add a generous pinch of salt. Add pasta and cook until al dente. Drain and set aside. Meanwhile, fill a small bowl with ice water, then set aside. Bring a small pot of water to a roiling boil. Add asparagus and cook until asparagus becomes crisp-tender, about 1 minute. Drain, then immediately immerse asparagus in the bowl of ice water. This will halt the cooking process and help preserve the green color. Drain and set aside. Melt 1 tablespoon unsalted butter in a large skillet over medium heat. Add onions; sauté briefly until onions become translucent. Do not let brown. If the onions begin to brown, you’ve cooked them too long. Remove from heat; spoon into a ramekin or small bowl and set aside. Melt 1 tablespoon unsalted butter in the same pan over medium heat. Add leeks; sauté briefly until the leeks are cooked through but not yet at the point of browning. Add asparagus and a pinch of salt. Give a couple of stirs. Add the spinach to the pan; cook until the leaves wilt but are still a bright green, about 2-3 minutes. If the pan seems too dry, add enough vegetable stock to the skillet so that a light sauce is formed. Turn heat up slightly. You can at this point add the milk if you wish. Whisk in the remaining tablespoon of unsalted butter, cut into bits. Reduce sauce until it thickens slightly, about 1-2 minutes. Add pasta directly to the pan. Mix well. Cook until pasta is warmed through, about 2-3 more minutes. Taste for salt and pepper. Spoon onto pasta bowls, sprinkle with parsley, chives and cheese, then serve immediately. Time: 45 minutes, including prep. This is my contribution for Presto Pasta Nights #260, a weekly foodblog event currently hosted and organized by Ruth of Once Upon A Feast. 17 Apr	This entry was published on April 17, 2012 at 11:55 pm. It’s filed under cooking, food, food photography, Presto Pasta Nights, spring, vegetarian and tagged asparagus, dinner, food blogging, food photography, Italian-American food, leeks, pasta, Presto Pasta Nights, spinach, vegetarian. Bookmark the permalink. Follow any comments here with the RSS feed for this post. They do say that “imitation is the best form of flattery”…. but I’m with you. I just takes a moment to ask… not to mention … mentioning the source! That said, I love, love, love your very Spring Primavera and can’t wait to hit the Farmers market this Saturday to see what particular Spring ingredients I can find. Thanks for sharing with Presto Pasta Nights. I was sorry to read that this has been happening to you. Also, just a cautionary habit that I recommend if you are not already doing it, google your site name periodically to check what comes up on the searches. Double check that there are not some weird sites claiming your content as part of its line-up that you don’t approve of or trying to phish for personal info. You will know it if you see it. Then do a spam report back to google. I’ve had to do this a couple of times already and don’t have nearly the traffic you do. Good internet hygiene I guess. Your pictures are really stellar so it’s not surprising that they are getting borrowed heavily, but it’s still very wrong for people to sneak off with them! Thanks for the tip and the compliment. I actually have Google Alert set up to e-mail me at least once a day whenever mention of my blog appears on a website anywhere on the Internet, though periodic googling can’t hurt either.